Backcountry skiing is a broad sport. Even seasoned veterans obsess over what might be the best gear for a particular endeavor. When selecting equipment, it’s important to ask: Where and when will I be using this? 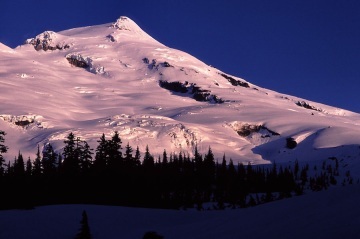 The answer could be: mostly at the resort with a little sidecountry; riding lifts through the winter, then big spring volcano-corn; skiing powder yoyo style through the winter, then spring corn; long, rolling scenic tours; steep ski mountaineering whenever possible; just instead of snowshoes on the approach to a climb. The possibilities are endless. It’s nice to have the right gear for the job. With the selection of ski gear available today, there are several good tools for any type of skiing. No licensed carpenter would use a sledgehammer to finish fine cherry cabinets; climbers don’t lead routes at Index on nothing but chocks and hexes like they did way back when; don’t spend your days lapping backcountry powder with Trekkers on toothpicks! I will enumerate the virtues and vices of a large cross-section of the ski gear available to the backcountry enthusiast. My natural bias is toward big descents that involve mountaineering techniques and wilderness travel, but I will attempt to give equal consideration to other piste paradigms. Take all advice with a grain of salt, proceed with caution, and consult a professional guide/avalanche expert before you put yourself in harm’s way.